Do you want to immerse yourself into whole new worlds? Try to use your smartphone and a Zeiss VR One Plus Virtual Reality Headset. This lightweight Zeiss VR One Plus Virtual Reality Headset is easy to wear for comfortable entertainment and it has an an easy-to-use tray holds your phone at the proper angle for 3-D viewing. With it, you have travel to the virtual reality world at home. If you have some DVD videos, how about starting your virtual reality trip from the DVD video with VR One Plus? Thanks to the universal tray most smartphone models are supported (Except LG G4 and Sony Xperia Z5 Premium). You can see that VR One Plus supports MP4 and MOV videos. So if you want to watch DVD video on VR One Plus, you can convert 2D DVD to 3D or rip 3D DVD to 3D MP4/MOV for VR One Plus. It is easy to fulfill this need with some VR Video Converters. Best Tool to Convert 2D/3D DVD to 3D for VR One Plus? Pavtube ByteCopy for Windows and Mac can convert any of our 2D and 3D DVDs into side-by-side 3D video and enjoy the splendid 3D experience with VR One plus. Apart from DVD, it also can convert 2D/3D Blu-ray disc into 3D MP4/MKV/MOV/AVI/WMV format with 3 different mode: Side by Side, Top and Bottom and Anaglyph 3D for direct viewing on virtual reality devices including Samsung Gear VR, Oculus Rift, Google Cardboard, Zeiss VR One, HTC Vive, ANT VR, etc or 3D TV, 3D Projectors. You can download the right version software by clicking the links on Windows and Mac to enter into the offical home page then follow the steps below to start convert 2D/3D DVD to 3D for VR One Plus. Below snapshots are all from Windows version but the steps are same as the Mac version. Step 1: Install and launch the latest Pavtube DVD to SBS Converter onto your computer; then click “Load files” to import DVD, DVD ISO/IFO or DVD folder. Choose subtitle, language or forced subtitles in the main interface. 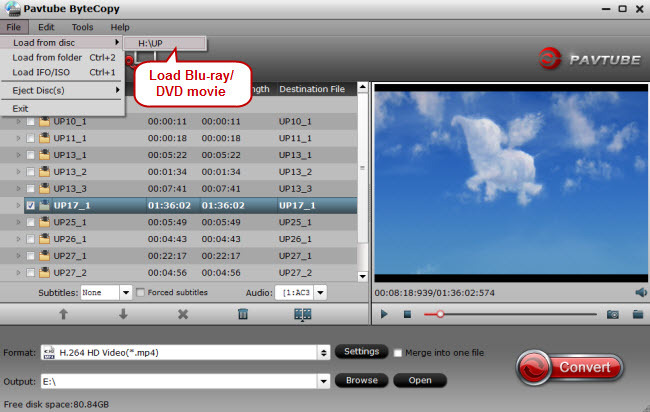 Tip: Pavtube ByteCopy can also rip DVD movies with multiple audio tracks and subtitles included, besides output good 3D effect, it is also able to encode the original soundtracks into 5.1 channels with your wanted language. Step 4: Hit the “Convert” button to rip your DVD movies to SBS 3D video for VR One Plus. 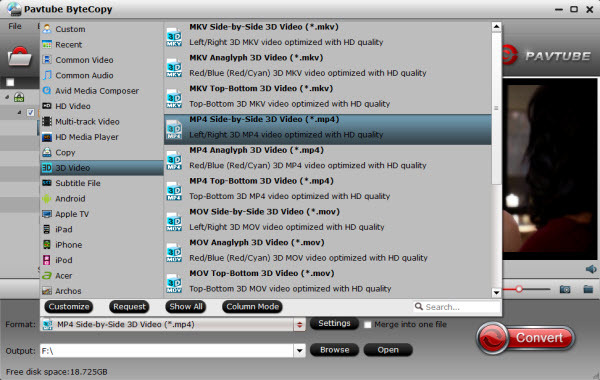 When it finishes, click the “Open” option to locate the created 3D video in output folder. The ZEISS VR ONE Cinema app enables you to enjoy your 3D movies in an immersive environment with the lights off. You can download it from Google Play or Apple App Store. Note that the VR One Cinema app can play SBS 3D MP4/MOV and 2D MP4/MOV/M4V file formats. 2. Movies in 720p resolution are best for watching in the VR ONE Cinema. Now, you can view your DVD video on VR One Plus in VR ONE Cinema without any hassles. List of Free VR Players for PC Available!